This is not a trick question. We all know that “scale” refers to the reduction in size with respect to the prototype. But besides that, in the “S” world, “scale” has a specific connotation that is absent for modelers in other scales. For S, “scale” also means that equipment so labeled conforms to NMRA standards for interoperability. This means that your “scale” equipment will operate on anyone’s layout whose track conforms to NMRA standards, and vice versa. Big yawn, eh? After all, N, HO, and O two-rail modelers enjoy universal equipment interoperability regardless of who makes the wheels and track they buy. But in S, the bewildering variety of incompatible track and wheel options (“scale,” “hirail,” “tinplate”) is enough to scare off all but the most determined of S scale newbies. So let’s clear away the confusion. Because of the dominance of American Flyer (AF) in S, the word “scale” has come to differentiate NMRA-standard S scale trackage and wheels from AF-compatible (“hirail”) trackage and wheels. The thickness and depth of AF wheel flanges prevents AF-compatible equipment from operating on NMRA-standard trackage. 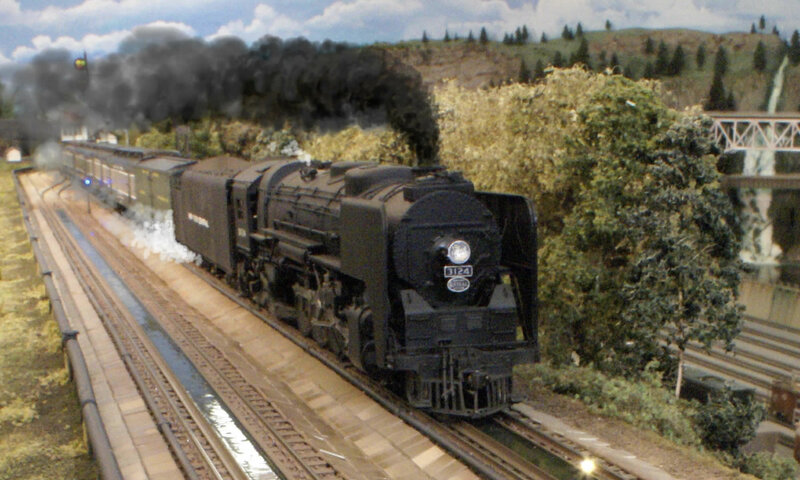 Conversely, NMRA-standard S scale wheelsets will not function properly on AF-compatible turnouts because their guard rail spacing is too wide to keep scale wheel flanges from picking frog points. The situation has grown even muddier over recent years as “hybrid” S turnouts have evolved that accommodate both “scale” and AF-compatible wheelsets. But unless you want to run both AF and NMRA-standard equipment on your layout, my advice is to avoid hybrid turnouts. Why? Well, track is a model too, and as such should look like the real thing. But additionally, non-S modelers implicitly rely on NMRA-standard equipment and trackage without perhaps ever realizing it. And if you move to S, you still have a right not to have to worry about interoperability. Sticking with S products that conform to NMRA wheel and track standards means you can stay in your comfort zone. S is blessed with NMRA-standard flextrack and turnouts in various sizes from several vendors (e.g., Shinohara, Tomalco) in several scale-appropriate rail heights (codes 70, 83, 100, and 125). If you aren’t interested in AF, there’s no reason for a scale modeler to use hybrid trackage products. Turnouts manufactured to S scale NMRA standards are very reliable and look very good indeed. S scale NMRA-standard flangeways, for example, are the same width as HO NMRA-standard flangeways. Therefore, because of S’s larger scale ratio (36 percent larger than HO), S scale turnouts actually look more realistic than HO turnouts. So go for it – give S a try. Just be sure to stay on the “scale” side of things!